Extensive preparations in the Friant-Kern Canal included cutting a low-flow channel to help in thoroughly draining an unlined reach before spraying in the Friant Water Authority’s fight against an invasive species, Western water milfoil. After months of preparation and weeks of drying out and removing silt from lengthy reaches of the Friant-Kern Canal, the main event has been completed in the Friant Water Authority’s fight against a voracious aquatic weed. A “cocktail” mixed from two chemicals was sprayed in late December on infested sections of the now-dewatered canal in the Authority’s all-out effort to curtail an infestation of Western water milfoil. Although the project required months of preparation and brought unexpected implementation challenges that prompted last-minute changes in plans, spraying of the combined chemicals required only a matter of days, said Eric R. Quinley, FWA Maintenance Manager. The intense effort is all being directed at trying to rid the canal of Western water milfoil, an invasive perennial aquatic plant that has made itself far too much at home in the canal through the Orange Cove area and downstream. Chemical treatment and management is being attempted because previous attempts at mechanical removal had little effect. By last summer, the weed was significantly reducing the canal’s conveyance capacity and causing water delivery problems that reached from Fresno County to Kern County. 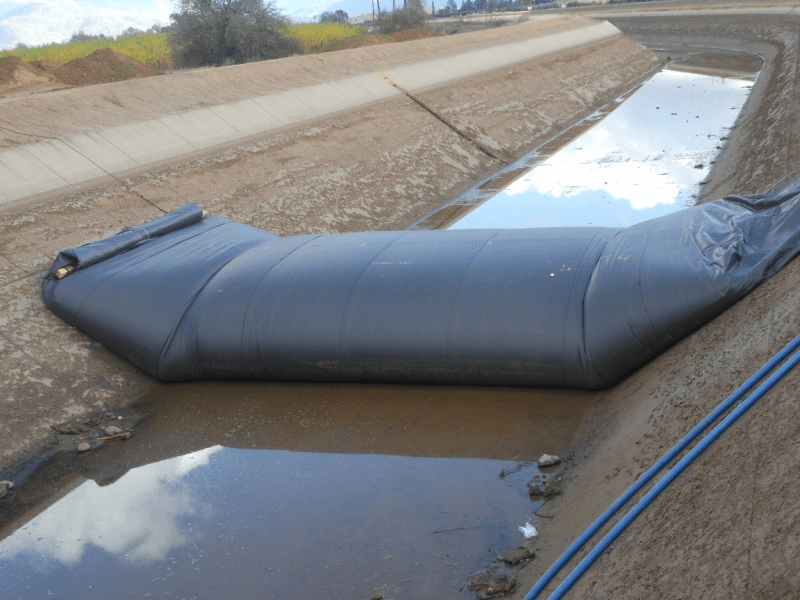 The Friant Water Authority made its first use of a water-filled barrier —- an Aqua Dam — near Woodlake to prevent any water used in milfoil treatments from getting past that point in case of heavy runoff entering the canal. summer before results can be determined and analyzed. 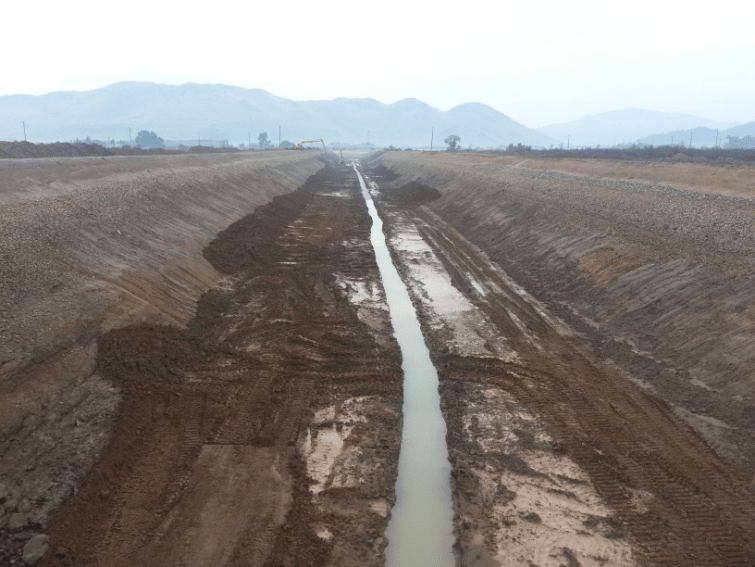 Now that spraying is complete, a waiting game begins for the chemicals to become fully incorporated into the canal floor through rainfall, drizzle from tule fog and water entering the canal from other sources. Safety procedures are in place all along the canal to prevent chemicals from getting beyond the treated areas during the treatment phase. Water quality testing will be conducted when water is reintroduced into the Friant-Kern Canal to ensure safe delivery to agricultural and domestic water users. 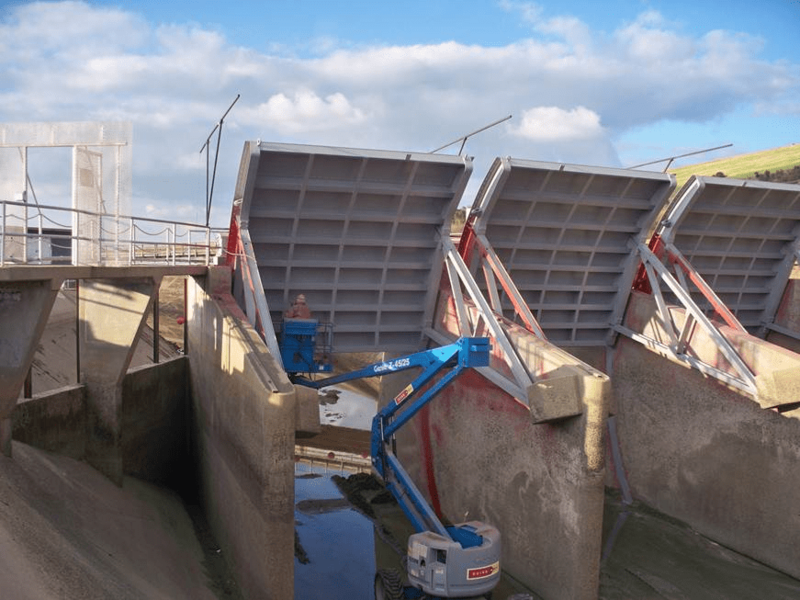 The entire process has resulted in a longer and more complicated Friant-Kern Canal dewatering schedule than is typically required for maintenance. Canal water deliveries are to resume no later than March 1. A number of major maintenance and repair projects have been concurrently under way and staff working on the milfoil treatment will now be joining staff who have been working on those other projects. A Friant Water Authority staff member works at repainting control gates at Rocky Hill Check on the Friant-Kern Canal between Exeter and Lindsay, one of the many major maintenance projects undertaken along with milfoil control during this winter’s canal dewatering. If the weather cooperates, FWA forces hope to reconstruct 150 more concrete liner panels over the next several weeks (100 have already been rebuilt) while completing rehabilitation of four district turnouts and a pair of check gates on the canal’s Terminal Check at the Kern River in Bakersfield. Work not related to the milfoil problem was largely suspended in early December to focus all efforts on controlling groundwater intrusion into an unlined canal section near Orange Cove where the weed problem was worst. Twenty-five pumps were put to work and a low-flow channel was cut in the unlined canal section to speed drainage and drying conditions.